Matisfaction wrote: Sonic Colours is supposed to be quite good (according to some), can't see it in the bundle so I'm guessing that it was exclusive to the Wii? Yes it was. Sonic Unleashed and Sonic 06 also never came to PC. Which is a shame because I would actually play Sonic 06 if I could have better load times. Join the revelry with PewDiePie and Revelmode. Revelmode and Humble Bundle are teaming up for a hand-picked (brofist-picked?) bundle! Revelmode is a curated talent network spearheaded by PewDiePie and united in its passion for gaming and pop culture. A curated talent network curating a Humble Bundle? Double curation bonus! Pay what you want for Robot Roller Derby Disco Dodgeball, Nidhogg, and Choice Chamber. Beat the average price to also receive Golf with Your Friends (Early Access), Skullgirls + All Characters and Color Palette Bundle, Spelunky, and Roguelands. Pay $15 or more for all of the above plus Rocket League! I feel like they missed a good joke here by not giving away Duke Nukem to people who do less than a dollar. Battleborn tanked so incredibly fast. melancholy wrote: Battleborn tanked so incredibly fast. It's still US$70+ on Steam though, which is crazy. Not sure if it's priced different in the US for you guys though. Anyone played Battleborn? I was thinking of getting this bundle. Lucky number 19. The Humble Mobile Bundle is back for a 19th round! Take some sweet Android games on your morning commute or your next road trip – just make sure not to Dropsy and drive. Pay $1 or more to receive Chameleon Run, Ys Chronicles II, and Hitman GO. Pay more than the average price and you’ll also get Punch Club and Super Stickman Golf 3 Premium. Pay $6 or more for all of that plus Dropsy and The Banner Saga. 4 more games have been added to the 2K bundle if you beat the average. PlayStation comes to Humble! It’s true – we’ve teamed up with Capcom to bring you a bundle full of Capcom PlayStation games! Pay $1 or more to receive Wolf of the Battlefield: Commando 3 for PS3, Strider for PS3 or PS4, Super Puzzle Fighter II Turbo HD Remix for PS3, Final Fight Double Impact for PS3, a coupon for 45% off Street Fighter V in the PS Store, and a coupon for 10% off Humble Monthly for new subscribers. 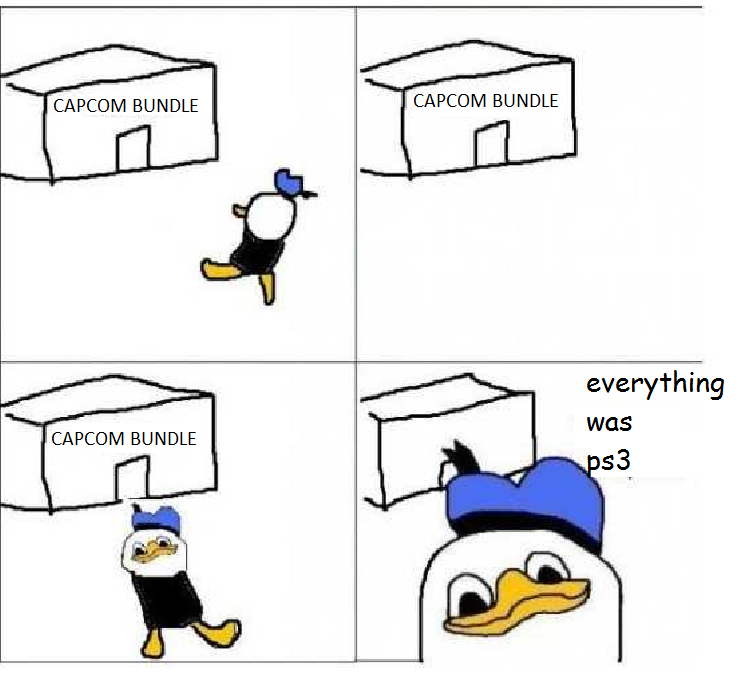 Pay more than the average price and you’ll also get Lost Planet 3 for PS3, Super Street Fighter 2 Turbo HD Remix for PS3, Resident Evil HD for PS3 or PS4, Okami HD for PS3, Remember Me for PS3, and the Mega Man 9 & 10 Combo Pack for PS3. Pay $15 or more for all of that plus Resident Evil 0 Remastered for PS3 or PS4, Devil May Cry HD Collection for PS3, and a coupon for 50% off Mega Man Legacy Collection in the PS Store. Pick a quest, any quest. Why, it's an absolute smorgasbundle of Sierra games! But where to start? That is the quest-ion. Pay $1 or more for Space Quest® Collection, Phantasmagoria 1-2, Police Quest™ Collection, and Shiftlings. You'll also receive a coupon for 10% off Humble Monthly for new subscribers. Pay more than the average of $12.52 and you’ll also get Arcanum: Of Steamworks and Magick Obscura, TimeShift, Quest for Glory 1-5, and Gabriel Knight 1-3. Pay $15 or more for all of that plus Caesar™ 3-4, Geometry Wars™ 3: Dimensions Evolved, King's Quest® Collection (1-7), and Velocity 2X. Pay $20 or more and you will also receive King's Quest: The Complete Collection! Only got twenty bundles in my pocket. It's the twentieth Humble Mobile Bundle! If you're hunting for a deal on some more awesome Android games, you've come to the right shop. Pay $1 or more for Cloud Chasers, Last Horizon, and Tomb Raider 1 & 2. Pay more than the average price and you’ll also get Always Sometimes Monsters and Shooting Stars!. Pay $5 or more for all of that plus Space Grunts and Cosmonautica. Bundled fresh at the source. GameMaker is back at Humble with a full bundle of software, games, and source files to help you realize your most ambitious game dreams! Tropico 4 is free at HB at the moment. Now is the time to seize the Day! Day of the Devs is an annual event in San Francisco, hosted by Double Fine and iam8bit, that gives developers from far and wide the chance to show off their games to guests of all ages. Great music and food are icing on the cake this November 5th! If you can't make it to the gathering, we've gathered together a bundle of games to make it up to you. Pay what you want for Lumino City, Broken Age, and Titan Souls. Pay $1 or more to receive a coupon for 10% off Humble Monthly for new subscribers. Pay more than the average price and you’ll also get Grim Fandango Remastered, Massive Chalice, and Oxenfree. Pay $9 or more for all of that plus Day of the Tentacle Remastered and a VIP ticket to Day of the Devs. This VIP ticket includes entry to the event two hours early, an entry to an iam8bit swag giveaway, and a coupon for 20% off in the store at the event, too! I'd buy some these if my craptop could actually play them. It doesn't take much to run these games. My laptop literately runs on Steam.